The marketer’s greatest weapon is data – when used in the right way it enables sales and marketing to strike gold by honing in on the most valuable customers, and focus campaign efforts, content, and experiences tailored directly to the right customers in the way that makes the most sense for them. At GE Digital – we found that we could do just this, by scoring our customers based on their activity and interactions, ultimately helping us find the customers that would deliver the greatest return for our marketing spend, pinpoint the leads that matter most, and build a more human interaction with our target audiences. Our sales teams were faced with too many leads in regional queues and had a tough time deciphering leads worth pursuing from those that weren’t. Sales was also having a hard time finding top priority leads and wanted better intelligence on the urgency of each lead’s inquiry – understanding the value of a lead involved clicking into the lead object, which was too time consuming and decreased sales productivity. We based our previous strategy for defining valueable leads on standard scoring best practices where a lead would reach marketing qualified lead (MQL) status after acquiring 100 points assigned based on their engagements with calls to action (CTAs), such as buttons on emails that allow you to register for a webinar or download a whitepaper. Our previous model was tough to maintain since it was based on forms, downloads, clicks, and opens. These made it time-consuming to update via traditional marketing activities as we often had new web page launches, content releases, and omni-channel campaigns. Moreover, the experience lacked a truly personal experience that provided our customers with content that was aligned with their desired outcomes. To top it off, from an internal perspective, ensuring a successful lead lifecycle setup required many steps and the inclusion of a whole host of stakeholders across Digital Marketing, Revenue Marketing, Inside Sales, Marketing Operations, and IT. A revised strategy and structure would necessitate the creation of a thorough change management program to secure buy-in and educate users. As a large company, the process of identifing customers well-suited for our offering can be incredibly complicated. In order to sift through the thousands of leads we gather, we implemented a new model that combined demographic, firmographic and behavioral data to not only assign leads, but prioritize them as well. 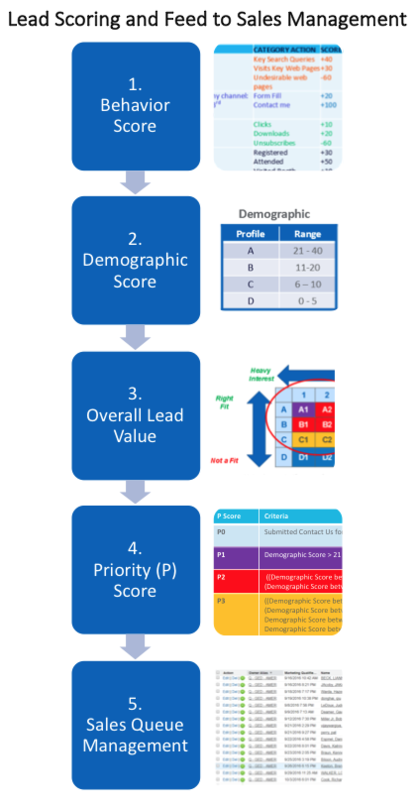 We implemented this priority scoring model based on demographic and interest rank to get leads with the highest engagement that best matched our target personas into the hands of sales faster, allowing them to focus on the leads that matter most and which are more likely to convert (all delivered to sales through the tool they use most – Salesforce.com). Inside Sales is now able to sort for and find urgent customers faster based on engagement and persona (tackling the highest priority leads first – from P0 (top priority) to P3 (lowest priority). Marketing and Inside Sales now speak the same language easily and effectively with quick communication based on the priority score. With an addition of a “p-score” field on the sales queue, our teams have a quick visual of the types of leads in the pipeline without having to click to each individual lead. For Marketing, we have simpler analytics on what is working and what isn’t in our lead scoring model, and we can invest in the highest conversion lead types by priority. In addition, our communication with sales, and the easy agile setup of this model, allows us to make more informed lead scoring updates quickly. We also implemented a Sales Insights strategy so sales can prioritize and view all key engagements by customer (what campaigns and collateral are “touching” each lead). Customers now get what they need faster as we can determine the best fit based on their persona – creating a more useful and human experience. This also allows us to provide better insights to our Digital Marketing, Revenue Marketing and IT teams. Initial results have proven that our new model has been able to drive more valueable experiences for our customers, and better leads for our sales team. With better data on our lead’s preferences, we now know who to target and how best to engage with our potential customers. Top of funnel velocity – to show the time it takes for a quality lead to reach our sales team. Sales stage conversion – to show overall impact and quality of leads through the buyer’s journey. Bottom of funnel deal velocity – to measure how fast we are closing opportunities once the right lead is with the right sales team. Our analysis showed that when implemented we could identify priority leads much faster and hand those leads off to the sales teams 4X faster than before which means sales can reach the right people at the right time, with more personalized content, faster. Digging deeper into our systems we traced some of the leads through their lifecycle (before and after the new model was put in place) to get a sense for how the system chose to prioritize some leads over others, and tweaked the model where it made sense. We spent weeks continuously reviewing and tweaking our lead scoring model with a cross-functional committee to make sure we were scoring appropriately based on not only what we could offer to the market, but also based on trends we saw with our target segments. The resulting model produced improved sales stage conversion rates with a 128% increase in converting marketing qualified leads into inside sales “accepts.” Our sales teams were accepting marketing leads at a higher rate because they viewed the leads as stronger matches with what GE Digital could offer. We saw similar increases in conversions for both “inside sales accepted” to “inside sales qualified” (17% increase), as well as “sales accepted” to “sales qualified” (3%) – again suggesting that the model is bringing in stronger and higher quality leads to our sales teams. The model is so accurate at capturing and managing good leads that we can see a positive correlation in the number of successful sales and the speed at which these leads are closing after being passed off to the sales team. Since the model automatically prioritizes accounts that fit the GE target account, more sales activities are aligned with our business strategy. Sales has since shared that the logic and structure behind this model has been instrumental for them to have more meaningful and tailored lead assignment. When high priority leads are given to sales, deals close on average 78% faster than before. Marketing operations and analytics have become pivotal in how we identify and interact with our customers. We have seen that through scoring we can not only focus our resources on the most important leads, but we can target those leads with the right content at the right time to make sure that we are delivering an experience that adds the most value to those customers when they need it. For us, delivering “humanized” marketing not only creates personal and valuable experiences for our customers, but it helps us focus limited resources on a few key leads to gain the greatest possible return.